Scott Fulton and Cindy Fallon-Fulton describe themselves as non-followers, but for several years, they were both part of the early-morning cattle ride commute that begins in the far reaches of New Castle and Chester counties and finishes in or near the corporate culture of Wilmington. Scott’s 35-year engineering and business career included serving as the head of a consulting firm and working for a number of years with DuPont. An organic chemist, Cindy spent 26 years in various technical and marketing roles at Dupont. They were riding the crest of success, but with each passing year, their careers were taking them further down the rabbit hole of unfulfilment. And yet, the inspiration that eventually led the Fultons to begin Home Ideations — a home mobility solutions company that helps families in Delaware and Chester County transform their homes in order to fit their changing lifestyle — came from something deeper than just their desire to leave the corporate world. Soon after Cindy’s mother passed from pancreatic cancer, she found herself caring for her father in failing health. She saw him slowly transition from a very active retired business executive who loved life — which included world travel and a hiking adventure in Thailand just prior to her mother’s diagnosis — to the slow and tortuous descent that went from the assistance of a walker to a wheelchair and finally, to a permanent bed. Cindy’s emotional experiences, combined with Scott’s years of engineering and managing contractors, inspired a year-long investigation that led to an ultimate discovery: that in the process of making some of the most important decisions about how to match their living plan with their life plan, millions of Americans were not achieving their vision to Age in Place. They could benefit greatly from a single point of contact to help them understand the challenges and develop a more robust plan. Enter Scott and Cindy Fulton of Home Ideations. As the only design, build and maintain firm in the region, Home Ideations brings a unique, holistic approach to help homeowners enjoy more time with family for many years — without having to sell their current home. Working directly with families, Home Ideations creates an across-the-board, here-to-there options plan that provides long-term solutions that explore the detailed financial comparisons of remaining in one’s home versus moving to an adult community; possible home design ideas; the development of a home plan and a managed maintenance service. In short, Home Ideations helps spell out the best path forward for seniors and their adult children. Scott said that about 80 percent of families who are mapping out plans to age in place are failing at it. 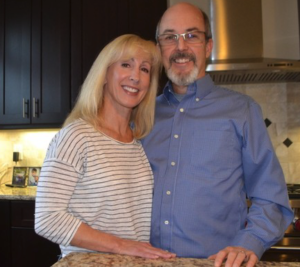 The Fultons begin many client relationships by designing a custom-made home plan, an exercise that helps each homeowner understand and articulate his or her home-life goals, and potentially avoid pitfalls later on. Perhaps the largest factor for couples and their families in planning for the future is whether or not to remain in the family home which, for many, becomes more of a burden than an asset. Bathrooms become danger zones, closets are unreachable, and mobility around the home, once taken for granted, is now a day-to-day struggle. Home Ideations encompasses the entire process of a new home renovation, from design to construction, with a specialty in designing for retirement and disability needs. As homeowners get older, the last thing they want to worry about is taking care of the endless “punch-list” of home projects and upkeep. Home Ideations’ maintenance management service includes routine comprehensive checks of the home, an up-to-date maintenance schedule, and handyman services. Home Ideations also provides a thorough list of all equipment and current services in an “e-binder” to help keep the home running smoothly. The Fultons believe that the mission of Home Ideations is to recognize that each client wants to continue his or her life’s story, in a place that is more than merely a structure that needs to be retro-fitted to suit their needs, but as a place of warmth and emotion, where some of their life’s best moments have happened. Home Ideations LLC works with families throughout Chester County. The company is available for seminars and presentations to church groups and 55+ community associations who are looking to better understand aging-in-place challenges and acquire some tools to help them develop their own home plans. To learn more about Home Ideations, visit www.homeideations.com, or call 302-584-6712.